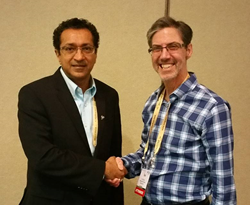 Ranjit Mulgaonkar welcomes Ted Sloan to the DNA Response team as Chief Revenue Officer. Ted’s collaboration in the development of new services and enhancement of existing ones will help us achieve maximum sales and brand awareness for our proprietary set of tools, techniques and expertise. DNA Response, a full service management and marketing agency of consumer brands on online marketplaces such as Amazon, eBay and Rakuten, announces the addition of Ted Sloan to their team as Chief Revenue Officer. In this role, Sloan will manage DNA Response’s Client Services Department, as well as oversee the company’s Strategic Business Development. His presence will help DNA Response provide exceptional client service and generate new business to continue on the upward trajectory it has seen over the last two years. Previously, Sloan was the Senior Vice President of Marketing and Business Development for Teleperformance Interactive, where he pioneered the use of Interactive Voice Response (IVR) for direct response television, building it from zero to 60% of the division’s revenue. He also worked as the Director of Q-Direct for nearly seven years, where he led QVC’s in-house DRTV marketing division and increased sales by 500%. To learn more about DNA Response, visit http://www.DNAResponse.com. DNA Response is a full service agency that manages sales and marketing for consumer brands in marketplaces like Amazon and eBay. We equip product companies and brand marketers to take control of their marketplaces channel and maximize the largest opportunity in retail. Marketplaces represent an unparalleled opportunity for retail brands to generate sales and capture data, but the open nature of marketplaces makes it difficult for brands to control their pricing, obtain data and maximize sales in the channel. Over 60 brand marketers rely on DNA Response’s end-to-end management solution to maximize revenue, protect their minimum advertised price, safeguard brand presence, and provide valuable business intelligence for over 200 consumer brands. Our turnkey solution includes sales, marketing, order processing, fulfillment, inventory management, and customer support - all on a pay-for-performance business model. Sell smarter with DNA Response to take control of your marketplaces presence and maximize the largest opportunity in retail. To learn more about DNA Response, visit DNAResponse.com.